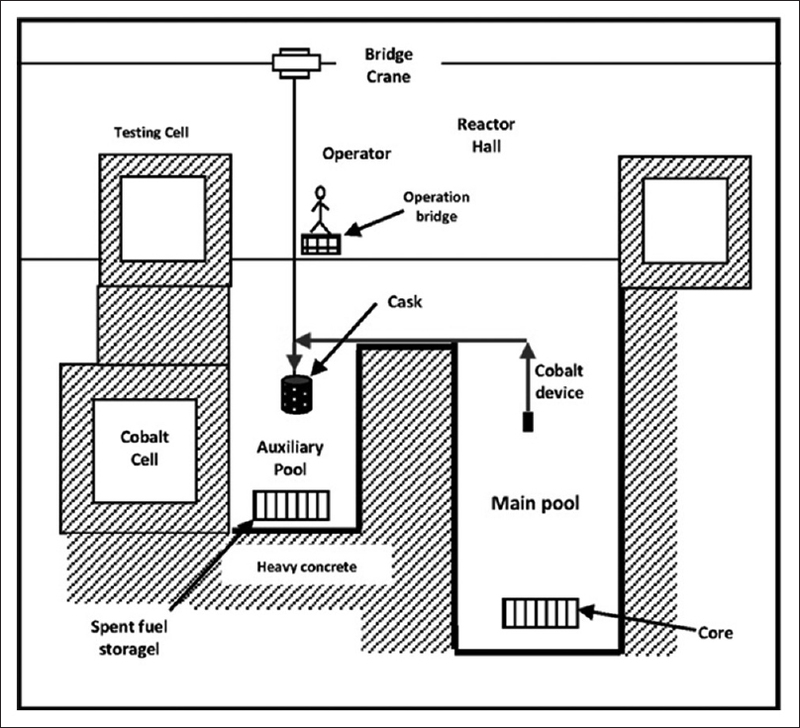 This study investigates the radiological risk that may occur during transport of cobalt device after irradiation in open-pool-type reactor from the reactor core to the cobalt cell. The cobalt transport process depends on using heavy shielded cask of 3500 kg weight under the water surface of the spent fuel storage pool which may cause a load drop accident. The load drop accident in the spent fuel storage pool would result in damage of 48 spent fuel elements (FE) maximally. Conservative evaluation for the amount of fission products release from the damage of the spent FE was considered in this study by assuming that all spent FE was recently stored at the time of accident. Consequently, the resulting radiation dose distribution was calculated around the reactor building depending on the meteorological data of the reactor site. GENII-2 code was used to estimate the individual effective dose distribution around the reactor. The result shows that the receptor who located at 1500 m from the reactor building in the south-east direction will receive the maximum individual effective dose of 0.11 Sv. Studying the anticipated accident in open-pool reactor must be evaluated from the radiological risk point of view. The core degradation and spent fuel storage damage in open-pool reactor are expected to cause accidents due to overheating or missile impact. Estimating the radiation dose resulting from the core degradation  and spent fuel storage damage must be determined to prepare the radioprotection and countermeasure actions. This study is focused on evaluating the radiation dose resulting from the spent fuel storage damage due to load drop as an expected accident may occur during transport of cobalt device. Transporting the irradiated cobalt is a complicated process in the reactor because it needs special precautions. The cobalt device has been irradiated in the reactor core for a long time to reach the required activity, and then, it will be transported from the reactor core in the main pool to the auxiliary pool. Then, the device will be loaded into a shielded cask, of 3500 kg weight, under the auxiliary pool water surface to avoid the radiation dose rise in the reactor hall and the control room. The auxiliary pool is for spent fuel elements (FE) storage so; lowering the shielded cask under the water surface must be done carefully to avoid cask dropping during loading the device. The cask drop is probably occurred from failure of the electric motor, the sling cable, and electrical power supply. Spent FE damage is the expected consequence resulting from the cask drop accident. The amount of fission products would disperse into the auxiliary pool water depending on the number of damaged spent FE. A mathematical model was applied to predict the maximum number of damaged spent FE. Another model was applied assuming that the fission products fraction was released from the damaged spent FE into the auxiliary pool water from which a certain fraction was released into the environment via the ventilation system. GENII-2 code  was used to simulate the transport of the fission products from the reactor stack to the environment and determine the effective dose distribution around the reactor. The reactor is an open-pool type of 22 MW thermal power core. The reactor contains main and auxiliary pools connected with transfer channel to enable transporting radioactive materials and spent fuel between the two pools. The main pool houses the core, at depth of 10 m underwater surface, which represent sufficient radiological shielding during normal operation. The auxiliary pool contains spent fuel element storage racks covered with more than 4 m of water sufficient to attenuate the dose rate over the auxiliary pool to lower than the permissible limit in case of the full capacity of spent fuel storage. The core is built on a supporting grid having 6 × 5 positions available for placing fuel or irradiation boxes. The core consists of 29 FE and irradiation position for cobalt device irradiation. The cobalt device is a fixed and in-core experiment, clamped at the bottom of the reactor core, and cooled by upward water coolant. The transport cask is then raised from the auxiliary pool and transferred through vertical opening that connects the reactor hall to the ground floor, where it is unloaded on a cart to transport it to the cobalt cell. Failure of the electric motor, breaking off the sling cable, and interruption in the electrical power supply, may result in cask-drop accident. Falling of an object would cause an impact on one or more spent FE  and so, a heavy cask drop on the auxiliary pool would certainly cause damage on spent FE. The accidental sequences result in a number of about 48 irradiated FE damaged. ORIGEN2.1 code  was used to calculate the inventory for the fuel element removed from the core with the maximum discharge burnup and after decay for 40 h in the main pool and then transferred to the auxiliary pool for long storage. 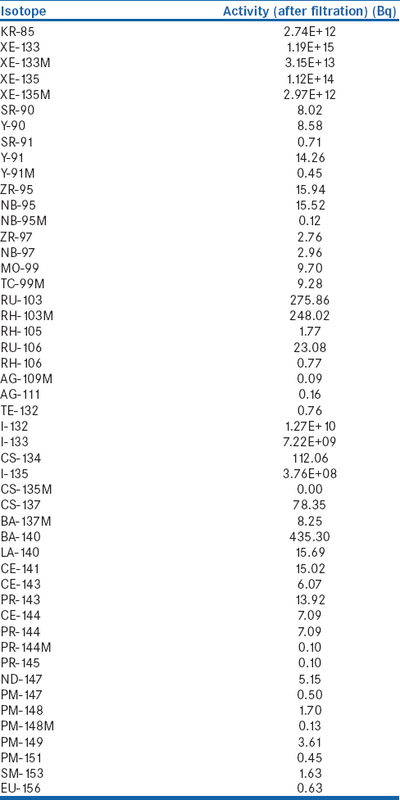 The inventory during the accident conservatively was calculated considering that all the FE was removed recently from the core (after 40 h) as shown in [Table 1]. The model  assumed that the fission products fraction would release from the damaged spent FE into the auxiliary pool water from which a certain fraction would release to the containment of the reactor. The fraction of fission products liberated from the fuel to the pool water (F1) and fraction of fission products liberated from the pool water to the containment air (F2) are summarized in [Table 2] according to the recommendations of IAEA safety report no. 53. Activity (noble gases) = Io (noble gases) × F1 × F2. Then, the fission products would release into the environment through a stack of 27 m height during a period of an hour. The meteorological data were simulated using the measured hourly data over 365 days for the reactor site. 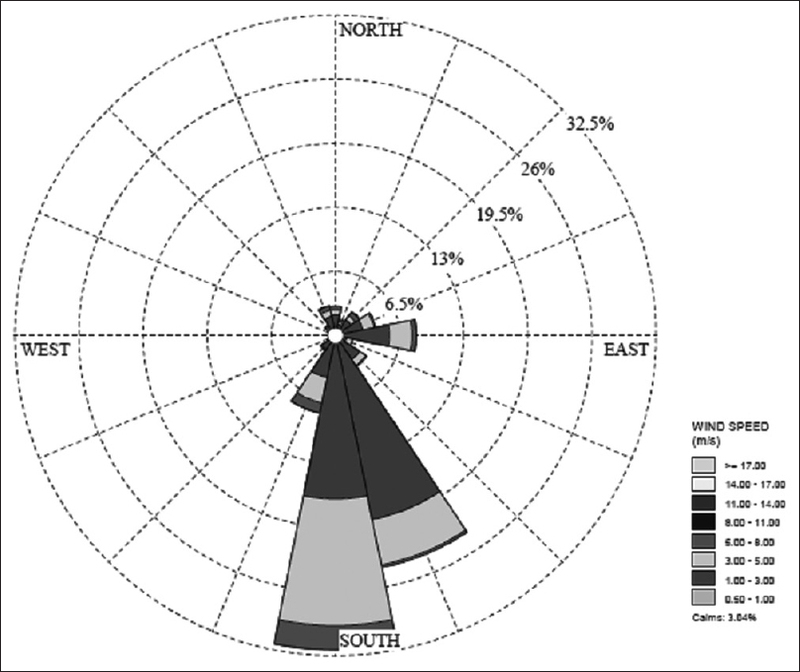 [Figure 2] indicates that 31.8% of the wind direction data was distributed from the north (N), 23.9% from and north-northeast (NNW) winds. Winds from NNE (8%) and west (8%) directions were lowly distributed. Wind from the north occupied the maximum distribution in the annual data whereas winds from the east had the minimum distribution. 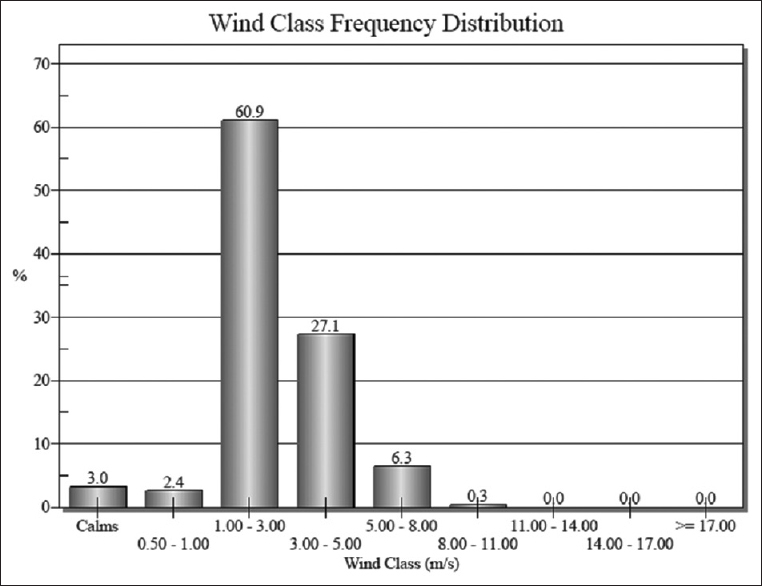 The wind class frequency distribution in the reactor site shows that light breeze, gentile breeze, and moderate breeze would represent 60.9, 27.1, and 6.3% of the wind speed distribution, respectively, as shown in [Figure 3]. Where, light breeze represents the wind speed which ranged between 1 and 3 m/s, gentile breeze represents the wind speed which ranged between 3 and 5 m/s, and moderate breeze represents the wind speed which ranged between 5 and 8 m/s. The GENII computer code was developed at Pacific Northwest National Laboratory to implement dosimetry models recommended by the International Commission on Radiological Protection. The GENII-2 system was developed to provide a set of programs for calculating radiation dose and risk from radionuclides released to the environment. In this study, a model was built to simulate the transport of the radioactive materials released from the reactor stack at the height of 27 m into the environment due to the postulated cask drop accident in the spent fuel storage pool. A set of models were constructed to simulate the radionuclides transportation and consequently estimate the distribution of effective doses within a distance of 5000 m from the reactor building in all directions. Exposure pathways include direct exposure from the contaminated soil, air inhalation, and direct exposure from air submersion. 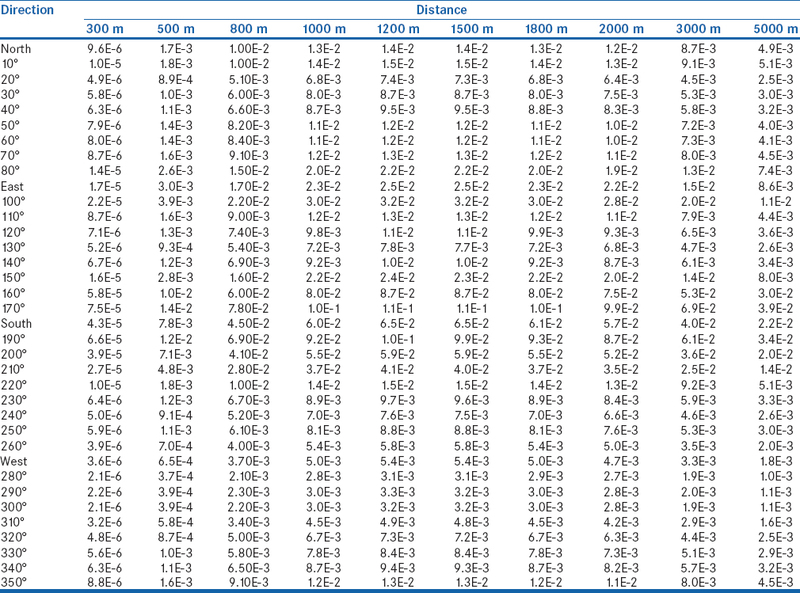 [Table 4] shows the individual effective dose (air submersion + inhalation + groundshine) distributions around the reactor site, the maximum individual effective dose was located in the SSE direction and certainly at 170° angle from the north direction. The dose at 170° angle would range between 7.5E-5–0.039 Sv along the distance between 300–5000 m from the reactor. The maximum dose value was 0.11 Sv which located at 1500 m at 170° angle from the reactor building. 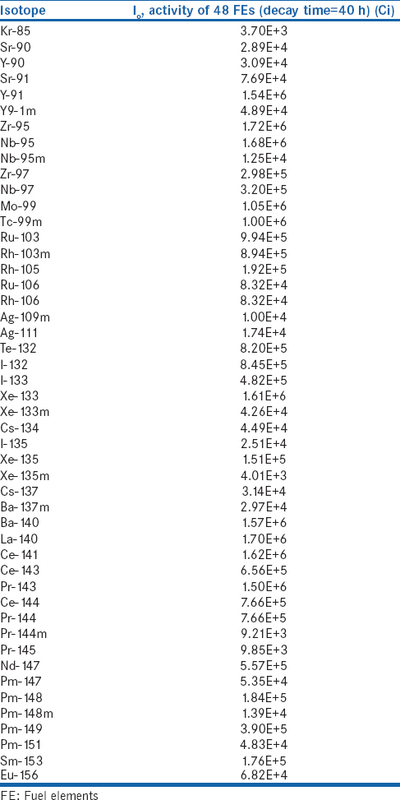 The contributions of noble gases (Xe-133 and Xe-135), iodines (I-131, I-132, and I-133), and aerosols (Te-132 and Cs-134) in the effective dose at maximum individual location were 6.4E-2, 4.8E-2, and 8.25E-4 Sv, respectively, as shown in [Table 5]. I-131, Xe-133, and Xe-135 are the main contributors in the effective dose with percentages of 35.8, 32.23, and 23.04%, respectively. [Table 6] shows the contributions of the different pathways in the maximum individual effective dose. The air submersion and inhalation are the main contributors in the individual effective dose. Since the main isotopes which responsible for more than 99% of the total dose, as shown in [Table 5], have half-lives within days and hours, then the dose in the real case would be lower than the conservative values with factor depending on the decay time of the spent FE. After decay time of 1 month, the effective dose would decrease to values <1% from the conservative values coming mainly from the ground shine of the contaminated soil. The uncontrolled release of radioactive materials occurs in the reactor containment area, and the direction of the dispersion path of such materials is strongly influenced by meteorological characteristics. In the annual meteorological modeling, the winds from the north and north-west accounted for more than 31.8 and 23.9% of the wind directions. The effects of wind distribution and radioactive materials dispersion at the reactor site were simulated with annual weathering data. The effective dose resulting from the accident was conservatively calculated considering that all the spent FE were stored recently in the auxiliary pool (after 40 h from removing from the core). The maximum effective dose would be 0.11 Sv and located at 1500 m from the reactor building in 170° direction. Hence, the real effective dose values would be lower than the calculated values. An alternative path to transport the cobalt device was studied by Abdelhady  to avoid the radiological consequence of this accident. Abdelhady A. Radiation dose level inside the control room of open pool type reactor during emergency situation. Appl Radiat Isot 2018;140:262-6. Abdelhady A. Radiation dose distributions due to sudden ejection of cobalt device. Appl Radiat Isot 2016;115:208-11. Napier BA. GENII Version 2 Users' Guide, U.S. Environmental Protection Agency under Contract DE-AC05-76RLO 1830; 2011. Final Safety Analysis Report of Open Pool Reactor. Argentina: INVAP SE; 2003. Abdelhady A. Radiological evaluation of an alternative path to transport cobalt device after irradiation in open pool type reactor. J Sci Eng Res 2018;5:78-85. U.S. Nuclear Regulatory Commission. Control of Heavy Loads in Nuclear Power Plants. USNRC Report NUREG-0612; 1980. Croff AG. A User's Manual for the Origen2 Computer Code, ORNL/TM-7175. Oak Ridge, TN: Oak Ridge National Laboratory; 1980. IAEA. Derivation of the Source Term and Analysis of the Radiological Consequences of Research Reactor Accident. Vienna: Safety Report Series No. 53; 2008.